That is, the code generator appears to duplicate the attribute name for the enum type instead of using the referenced enum type. Obviously this will not work - but it does insidiously compile and run because a DistributionCenterRollup class containing the to/from JSON convertors is also generated - a (de)serialisation error inevitably occurs during code execution. This is a show-stopper for me as I have a large number of referenced enum types in my JSON. I'd say there is an incorrect call somewhere that wrongly passes the attribute name instead of the attribute type name when the attribute is an enum. 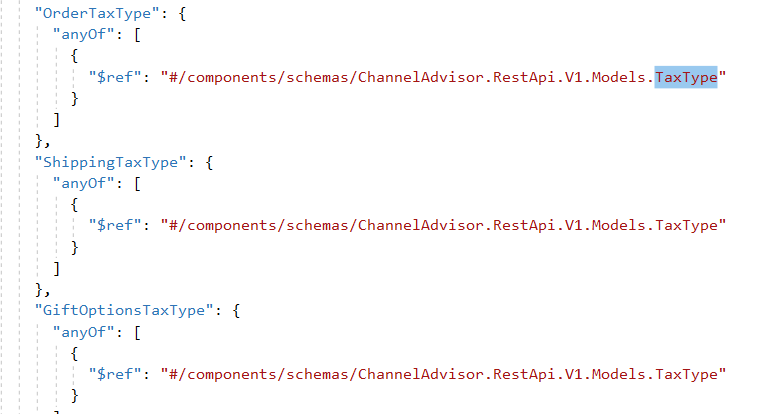 Please also note that the generated code in the JSON convertor type also wrongly converts itself instead of TaxType! AFAIKS there should be only 1 convertor class per enum - not a converter class per enum attribute. Replacing anyOf with oneOf fixes the NSwag generation issue. Thanks. Fixed with the above commit, will be in the next version soon.